Two years ago, Michelin began rating restaurants in the USA. Michelin stars carry so much weight in Europe, that losing a star has been known to drive chefs to suicide. The French tyre company has been publishing its restaurant guides for Europe since 1900. Michelin's first guides for the US released two years ago covered New York and the Bay Area. In November they will release their first guides for Las Vegas and Los Angeles. This year, 27 Bay Area and Wine Country restaurants recieved at least one Michelin Star. Here's the list for those of you who are interested; the ones marked new! made it to this list for the first time in the 2008 Guide. 2009 Update: I have updated the list below to the latest Michelin ratings. While Coi is the only addition to the two star list, Chez TJ lost one star.Murray Circle in Sausalito, Plumed Horse in Saratoga and the Village Pub in Woodside earned their first stars. K&L Bistro, Quince, and La Toque lost their stars in 2009. 2010 Highlights: The French Laundry still the only 3 star, Michael Mina loses a star, Aqua no longer starred. Bistro Jeanty and Martini House lose their stars too. Aziza, Commis, Etoile, La Toque, Luce, Quince, Sante, Solbar, and Ubuntu are new entrants with a star each. Coi, San Francisco New in 2009! Murray Circle, Sausalito New in 2009! Plumed Horse, Saratoga New in 2009! Village Pub, Woodside New in 2009! Chej TJ, Mountain View (My experience posted here) Lost a star in 2009! K&L Bistro, Sebastopol Lost its star in 2009! La Toque, Rutherford Lost its star in 2009; back in 2010! Quince, San Francisco Lost its star in 2009; back in 2010! Incidentally, Michelin uses inspectors who dine anonymously multiple times in short-listed restaurants before awarding them stars. While ambience, service, decor, cleanliness and general comfort level are also evaluated, the stars are given solely for the restaurants' cuisine. OK, There's like 5 places in Yountville... what's that about? Yountville is a culinary hotspot apparently. I'll have to get there again, I always thought of it as a hick town in the wine country. @sank: Apparently, other than San Francisco, Napa Valley is the place for great food (to go with the great wines). Also, two of these five places are owned by celebrity chef, Thomas Keller (the only three starred chef in both Bay Area and NYC). @sandeepa: I hope I do! It's been a while since I have spent time on the East Coast (other than for Florida where I did travel this year). @shantanu: Enjoy! 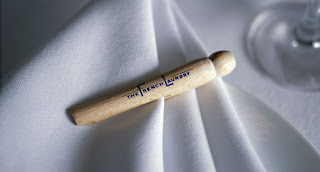 :-) In any case, it's difficult to combine a visit with the French Laundry with other things, given that you have to book almost 3 months in advance down to the exact date. So how many of these chefs have had a nervous breakdown? i've heard getting a michelin star can drive you up the wall. @amrita: There have been more than one such case in France. Wow, what a site. It is difficult to believe that it is owned by one person.